This was a race that didn't seem to want to be. My experience in 2014 was less than stellar so I wasn't inclined to repeat. But time dulls the irritation. I was giving thought as to what I was going to do the weekend after Northshore. My A2A training "lite" plan meant no full distance skate. Probably a 100K on Canada Road. But wait. Isn't that the same weekend as the New York 100K? I could do a 100K on Canada Road or I could it in New York! Maybe. I checked Skatelog. The road had been repaved. Good. They were better at starting on time. Good. The lanes had been rearranged making bikes less of a problem. I didn't quite buy that one but starting on time would do a lot and I did now have an electric horn to encourage non-racers to make room. The flights were also unusually reasonable. I was in! All was going smoothly until Tuesday before the race. I woke with a raging sinus infection. Usually I Sudafed up at the first sign of congestion but this one got away. On Thursday night I managed to reduce the magnitude of the affliction but it was still there. Could I skate 100K in this condition? Should I call the whole thing off? I didn't know but I nearly all the expenses for the trip were pre-booked and non-refundable. Even clawing back the vacation time was going to be trouble. I didn't seem to be much of a choice. I opted to keep up the emergency measures and hope for the best. Next problem. The flight left at 7:30am, not 8:30 as I remembered and I wasn't done packing. I slept 3 hours. Perversely, the plane had mechanical issues. We actually took to the air at 8:30am. In the air a new problem arose. My digestive system was in revolt. It seems that while I was trying to tame the sinus infection I had not paid inadequate attention to the more common problem. On the ground I employed more emergency measures. I slept five hours. The morning was more challenging then it had a right to be but I had allowed enough time. I was more confident in my digestion than in my sinuses but I wasn't sure of either. What was there to do but walk the half mile to the start line? At the start line, all seemed manageable. I even had an extra half hour since the start time was delayed. Not the over an hour delay of 2014 but still not helpful. It was a distressingly nice day. I met Jack and Shafeq, the only non-elites doing the "pro-only" 100K. The race started in mass, which is simpler and more sensible than the staggered 100K then marathon of 2014. Although the plan was to hang with a fast marathon pack for the first eight laps, I didn't feel comfortable/capable of going full bore. On the first shake where I needed to push hard to meld into the pack, I didn't. I stayed behind Jack. Shafeq made the jump. For the next eight laps it was mostly just me and Jack. I pulled most of the distance. Jack took over for the flat headwind stretch. We weren't fast. By the fifth lap we had dropped below four hour pace. Our marathon time was a dismal one hour fifty minutes. At that point we caught with Shafeq who was coasting after his marathon pack finished. Adding Shafeq brought new life our little pack, making my colossal pulls much shorter and less draining. Unfortunately it was not to last. After two laps, he had finished his "virtual Athens to Dacula" and called it quits. I hadn't known that plan. I would cramp on every climb now. Oddly, it didn't seem to affect me on the downhills. On lap 16 I needed water. Experience has taught me that the three liters in my camelback was enough for four hours but the margin is small. We weren't going to make that time and 2014 taught me that there is no water past four hours. As we passed the water station, I called out but no-one answered. On lap 17 I stopped and grabbed two tiny bottles. I had to. No one was at the water stop to hand them out. Jack was getting very slow climbing the rough and crowded hill. I stopped trying to match pace. My cramping was more manageable if I moved faster and waited for Jack to catch up near the top. We finished lap 17 just after the four limit. We were given the signal to stop. We didn't, of course. As we approached the water station, I called out again. Slow response. One person on skates chased me down and handed me a bottle. I now knew I had enough to drink. The cramping was getting worse, extending to the very top of the hill. As we finished lap 18, were again given the signal to stop. Did we? What do you think? I didn't need water this time. In fact I was still getting what I needed from camelback, which surprised me. Once Jack caught up near the top, I took off the governor. It was the last lap and I no longer needed to conserve energy. I chose to ignore the health implications. I lead the full distance with all the power I could muster. Early in the decent of the big hill we encountered our first four abreast slow bicycles. We managed to squirm past. The headwind flats are the beginning of the finish sprint. As we approached the line, I thought of grabbing Jack's hand for an intentional tie in the A2A tradition, but couldn't be bothered. I finished a whisker in front of Jack. Four hours, thirty-six minutes, unofficially. Officially it was a DNF because we didn’t make the four hour time limit. I still had substantial sport drink remaining in the camelbak. This would explain some of the cramping but made little sense itself. A couple of hours later as I struggled to consume lunch, I understood. My sinuses weren't happy either. How might I finish New York if I didn't have boot and traffic problems ( 2014 ) or health problems ( 2018)? 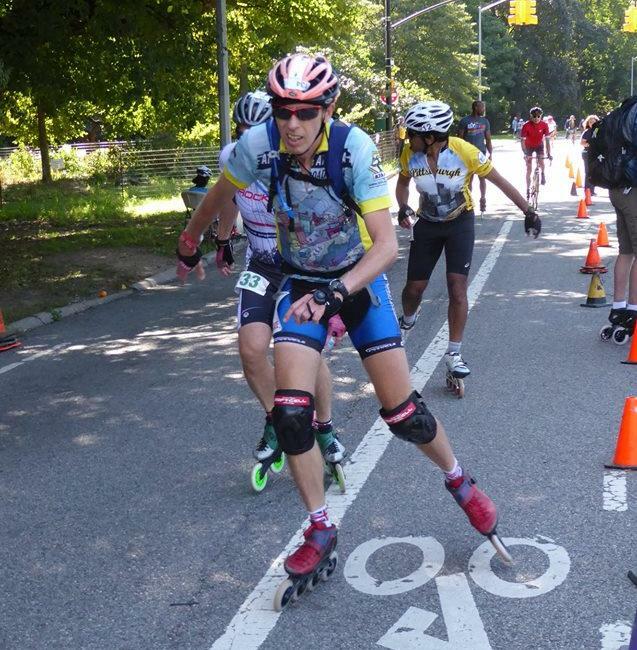 I’ve done sub-4 hour 100K’s on Canada Road with more elevation gain so it should be possible to do that in New York, if I have someone suitable to skate with. But I won’t find out in 2019. Next year’s 100K is the weekend immediately preceding A2A. Inadequate recovery time between the races means I can only do one. If I have to choose, I will always choose A2A.